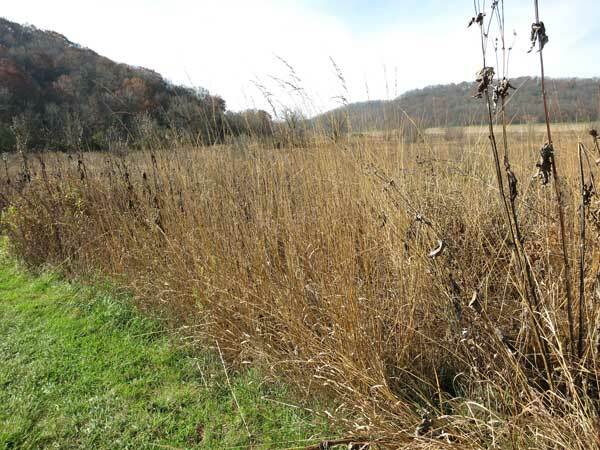 Tom's Blog: Prairie burns in the fall? Why is it so hard to get a good prairie burn in the fall? It would be nice if prairies could be burned in the fall. Not many people are burning so it is easier to get a burn crew together. In our area, no DNR permit is needed, which simplifies scheduling. Unfortunately, fall prairie burns are difficult to accomplish effectively, primarily because the principal fuel, warm-season grass, is often not cured. What is curing? 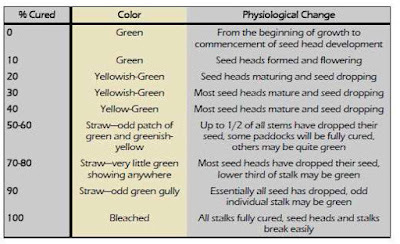 Most tallgrass prairie species go through a life cycle that involves growth and seed production, after which the above-ground plant matter undergoes senescence followed by death. 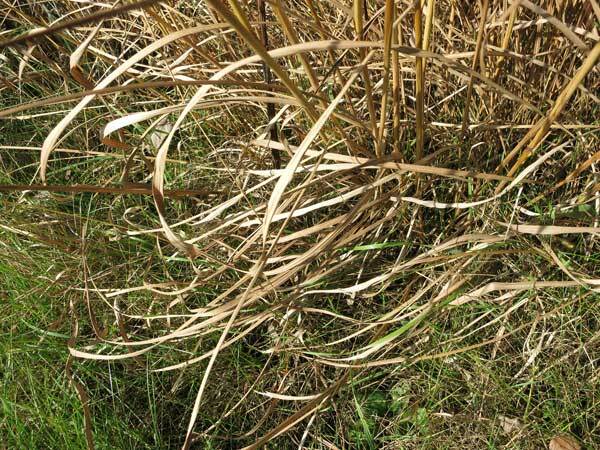 (In perennial grasses, the roots remain alive and carry the plant through to the next growing season.) During senescence the leaves start to lose their chlorophyll and brown patches or spots appear. At about 50% cured, whole sections of the leaves become brown and gradually the whole leaf becomes brown. At this point, the grass is 100% cured. From then on, the moisture content of the plant will no longer depend on the plant itself, but on past rainfall and relative humidity. The curing process will vary with the year, and with the site. 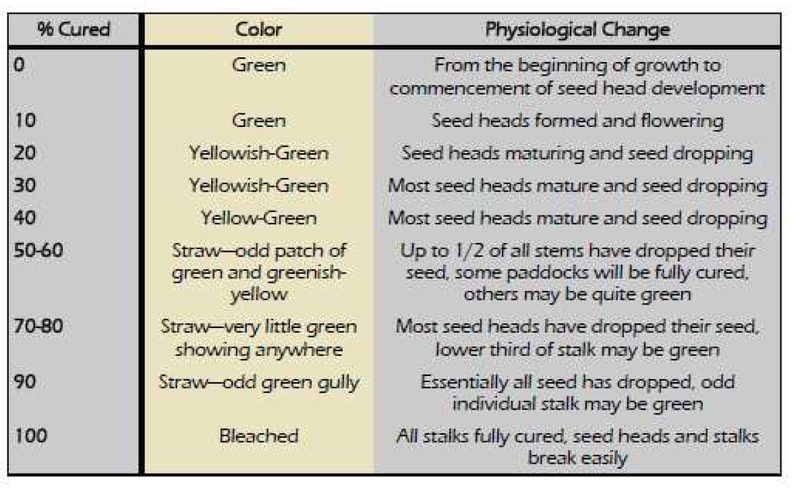 The progression of curing will be different in different prairies, and will be affected by rainfall and temperature. Even in a single prairie, curing can be patchy. Most of the research on curing has been done in Australia, and involves completely different species and different habitats. But the general principals are the same. Here’s a link the the Australian work. If the prairie is not burned annually, some of the fuel will be dry residues from previous seasons. This material is of course fully cured but will not carry a fire as well as fully cured prairie grass from the present growing season. There is also a U.S. curing guide focusing on the Great Plains, provided by the U.S. National Weather Service. In addition to the data in tabular form (see below), there is also a photographic guide, which can be found at this link. In our climate in the southern part of the Upper Midwest, curing is a rather slow process, and may often not be completed before the snow flies. This explains why fall prairie burns are often unsatisfactory. However, not all is lost. We have actually had a quite successful prairie burn in early December in a year when snow was late in coming. The grass then was fully cured. We wanted to burn then so that we could get all the thatch out of the way so we could spray smooth brome as soon as it came up in the early spring. A December burn just takes luck and an ability to move immediately when conditions are right. Periodic monitoring of the site is essential. Also, I have seen years when prairie burns could easily be accomplished on the odd day in either January or February. Obviously these are not fall burns, but the grass then is fully cured. This just in from the 11-1-2016 survey. The warm season grasses at Pleasant Valley Conservancy are now fully cured. (See photos below) This is earlier than usual. In the morning the humidity was fairly high and there was dew on the grass everywhere. But by noon the humidity had dropped and the temperature was rising. By 3 PM the humidity was about 40% and the temperature was 72 F. A great time for a small prairie burn. Just a light wind. This emphasizes one of the demands of doing controlled burns: the ability to jump when the conditions are right. And you obviously can't wait until tomorrow, because tomorrow (now today) it is raining! Fully cured Indian grass in the Barn Prairie. Ignore the green, which is an adjacent mowed lawn. Fully cured prairie grass, ready to burn. By 3 PM the RH was 40% and the temperature was 70 F. Light wind out of the NE.